The View from Squirrel Ridge: Deer, Birds, and a Squirrel. Deer, Birds, and a Squirrel. Looks like my trail cam took a better deer picture than I would have! I haven't actually seen deer in that part of our yard so the pictures were a surprise. Earlier this summer Frank saw a bear lumber through there, which is why I moved the camera to that position. Mr. Bear has not come back yet. He has been spotted by neighbors who live near the river numerous times. 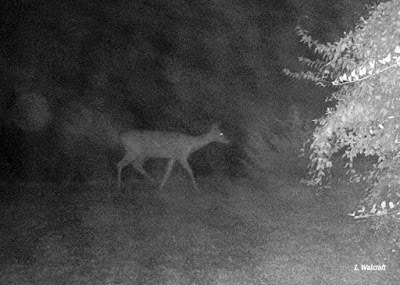 Here's a night picture of the deer, also taken automatically by the trail camera. 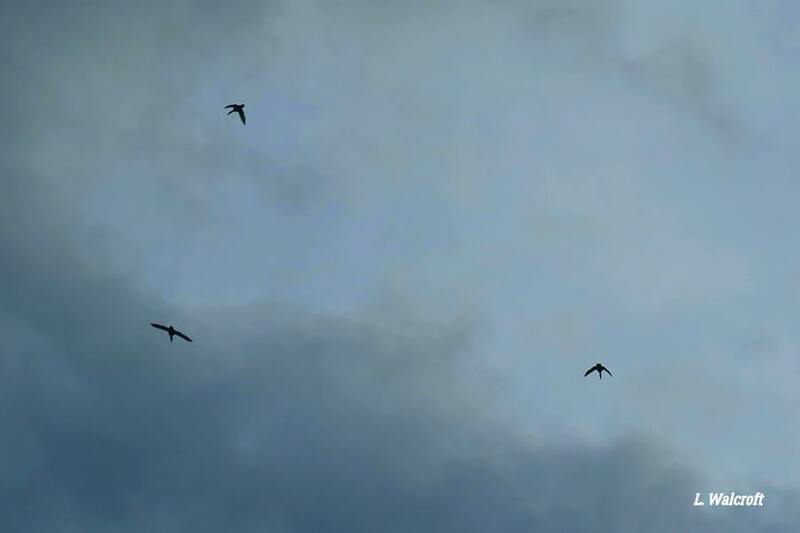 I cropped it and brightened it slightly. 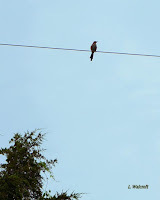 Here's a picture that I took of a bird on a wire. It looks a little dull to me so I cropped it and added a bokeh effect using Movavi software (see next picture). What do you think? Below that we have some geese flying on a cloudy day. 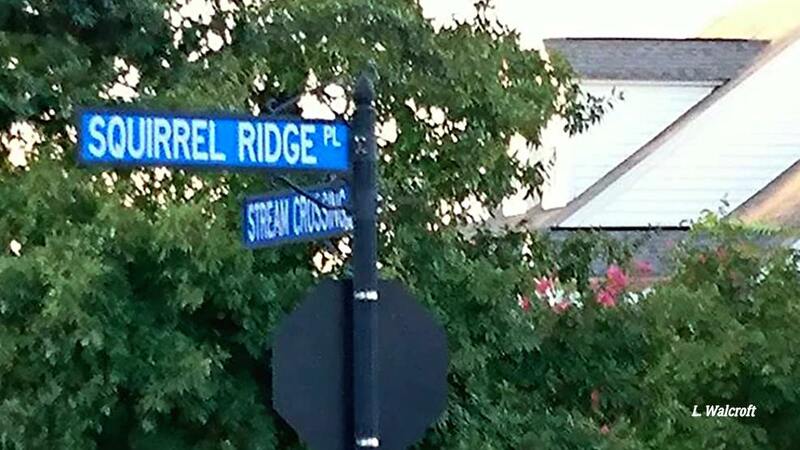 I was surprised to come upon this street in Loudoun County. 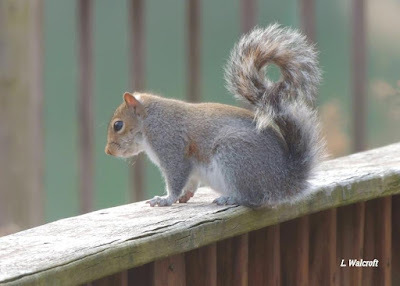 Speaking of squirrels, I haven't photographed any lately. I don't have the bird feeders out because they attract bears, so the squirrels haven't been hanging out close to the house. This picture is left over from winter. AMAZING STREET SIGN!! We need to figure out which one of us will hold the ladder whike the other is unscrewing it from the post!! With everything said, I say 'thank you' for taking time to share this post & bird photos with us all at I'd Rather B Birdin' this week! Hello, love the pretty deer. The street sign and name is great. Cute shot of your squirrel. Thank you for linking up and sharing your post. Happy Sunday, enjoy your day and have a great new week! PS, thanks for the comment and for visiting my blog. That first deer shot is a winner! Your trail cam took a really pretty picture. I also really like what you did with the photo of a bird on the wire. Nice effect with the bird on the wire. 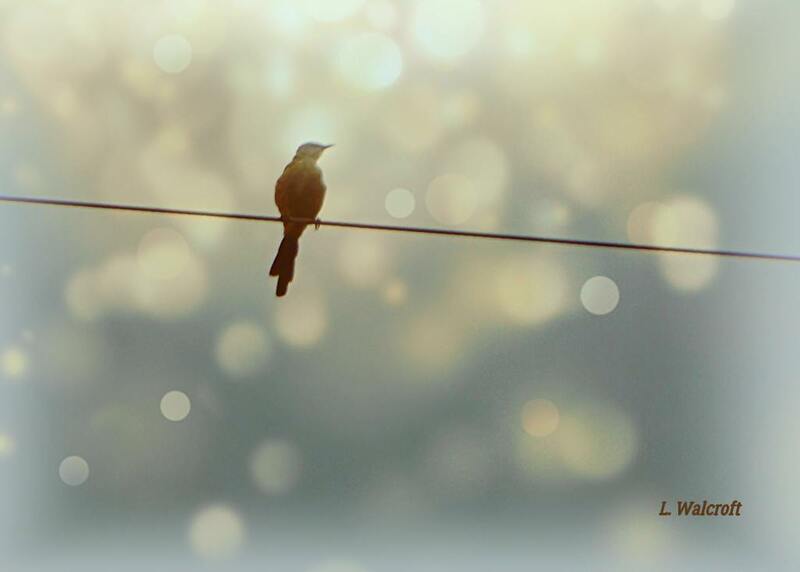 love that bird on a wire!! Nice pictures! I really like that first deer shot. Cool sign!